Eltronicschool. - This is one of the best electronic designing software for developing and debugging Atmel ARM Cortex-M MCU based apps that called with Atmel Studio. One of the version of this software is Atmel Studio 6.2 for Windows system. Beside we will give you the dscription of this software, we also will give you the link to take free download Atmel Studio 6.2 for Windows from external server. This Atmel Studio 6.2 for Windows for you in this time. According Software Informer site describe that Atmel Studio 6 is a program designed for developing and debugging Atmel ARM Cortex-M and Atmel AVR microcontroller (MCU) based applications. The Atmel Studio IDP gives you a seamless and easy-to-use environment to write, build and debug your applications written in C/C or assembly code. 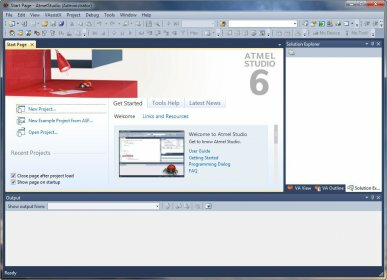 And now you can click the link below to take free download Atmel Studio 6.2 for Windows from external server easily.